Product #16289 | SKU HYPERCORE -98S | 0.0 (no ratings yet) Thanks for your rating! 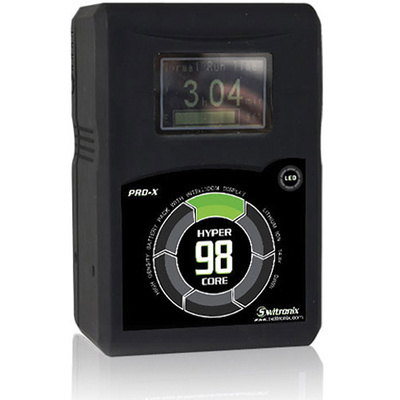 The Switronix HyperCore 98 14.8V V-Mount Battery is a 98Wh lithium-ion battery featuring high density cells designed to handle high power draws. Supporting more amperage per cell, the cells can withstand up to a 10A draw for extended periods without diminishing service life. Overall service life is rated at 1000 charge/discharge cycles. Run-time is projected at 3.5 hours at 25W. Safety sensors are built in that detect over/under voltage, over/under current, and above-normal temperature. A Intellicom backlit LCD and a 4-LED gauge provide operating run-time in hours and minutes, remaining capacity as a bar grid and percentage, and remaining charge time. An on-board fuel computer samples capacity and charge or discharge load and recomputes and refreshes the LCD display every five seconds. The HyperCore 98 works with all Switronix chargers and dictates the best possible charge routine with regard to maximum life. It's best used with Switronix XC-2LS and XC-2LA chargers as they'll provide faster charge times. A PowerTap port and USB port are available on the side for powering accessories and charging various devices. The outer jacket is made of comfortable-to-hold, non-slip rubber.